I have always been of the opinion Bay scallops were not real seafood. I mean they are so tiny, and the flavor is very meek. They are not at all creamy and tender like their larger, sweeter, buttery-er cousin, the Sea Scallop. Quite frankly, I really haven’t had much use for them at all. Not that I am a food snob by any means…well, ya got me on that one. Food snob I may be, but at the very least, I am fair and willing to give things a second or third shot at achieving deliciousness. Shouldn’t all foods be given that opportunity? To be brilliant? Amazing? Simply fabulous? Stunning even? I say yes. It was time to take Bay scallops to the next level and put some lipstick on that pig mollusk. Last night I was in the kitchen, staring at the Bay scallops. They were staring back at me. Unlike the very extroverted, communicative coleslaw from a couple of nights ago, these things were totally silent. Complete introverts. Great. So, I drank some wine and stared some more just waiting for a thought of ANYTHING to do with these little pieces of nothing. I knew better than to try this. (Insert second sip here) I knew no good could possibly come of it. (Insert gulp here) What was I thinking? 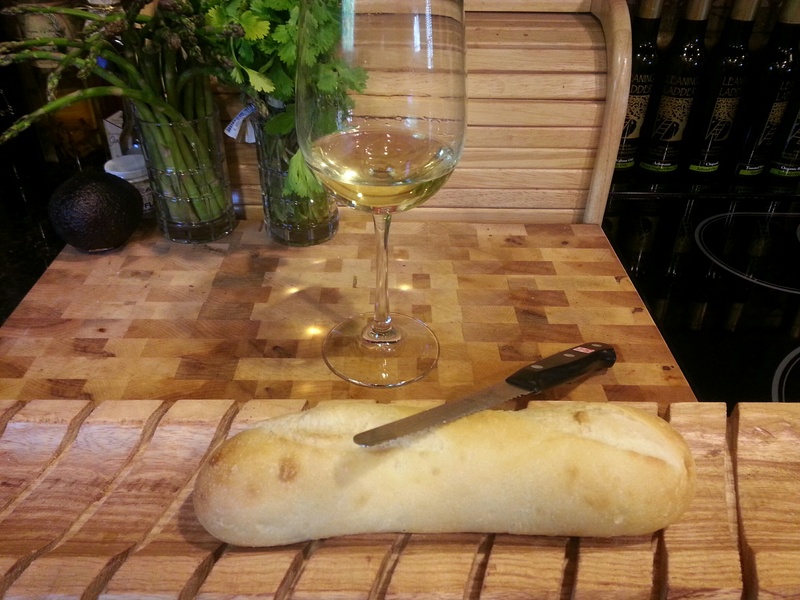 (Have you ever made a shooter out of a glass of wine?) I should have just let well enough alone and…………….. BREAD PUDDING!!!!!!!! A seafood bread pudding. 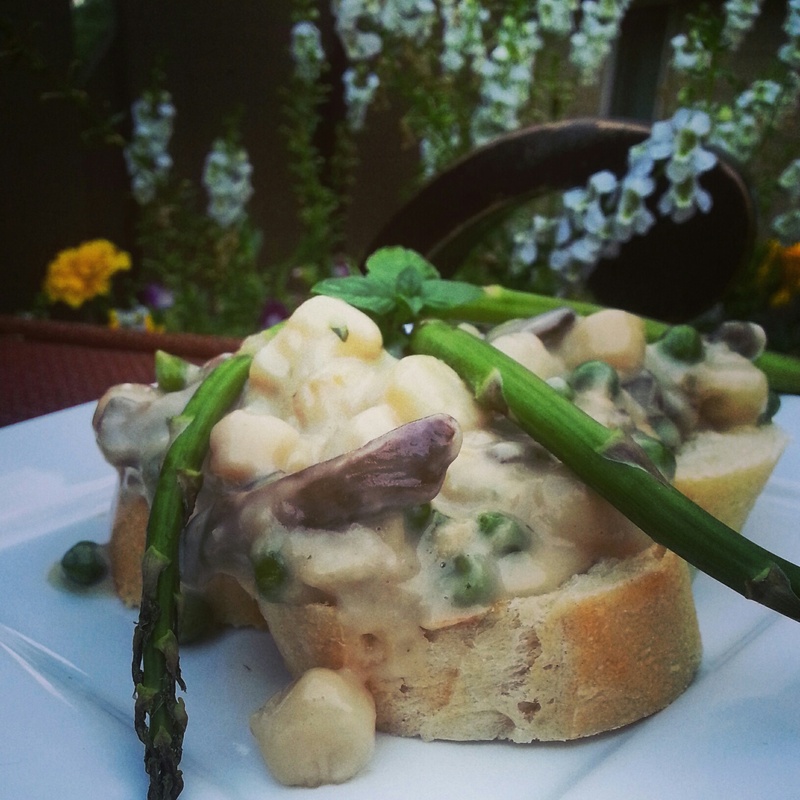 A Bay scallop bread pudding! 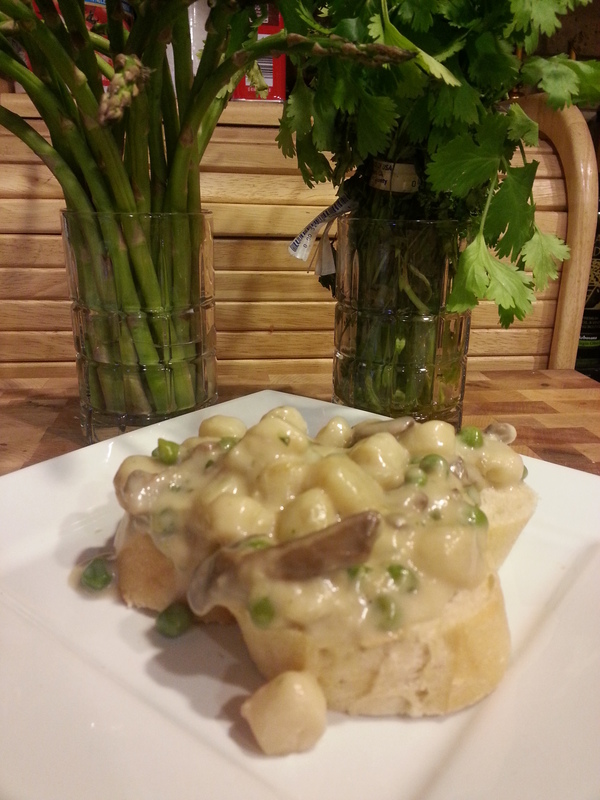 With peas and mushrooms in a gorgeous Veloute! YES! SCORE! Bay scallops CAN be a thing of beauty! We sure put some lipstick on that mollusk baby! Melt the butter in a saute pan over medium heat. Stir in the flour and cook for 2 minutes. Whisk in the stock, 1/2 cup at a time until smooth. Bring the sauce to a boil, reduce the heat to low and cook for 10 minutes. Season with salt and pepper to taste. Add pinch of Nutmeg. 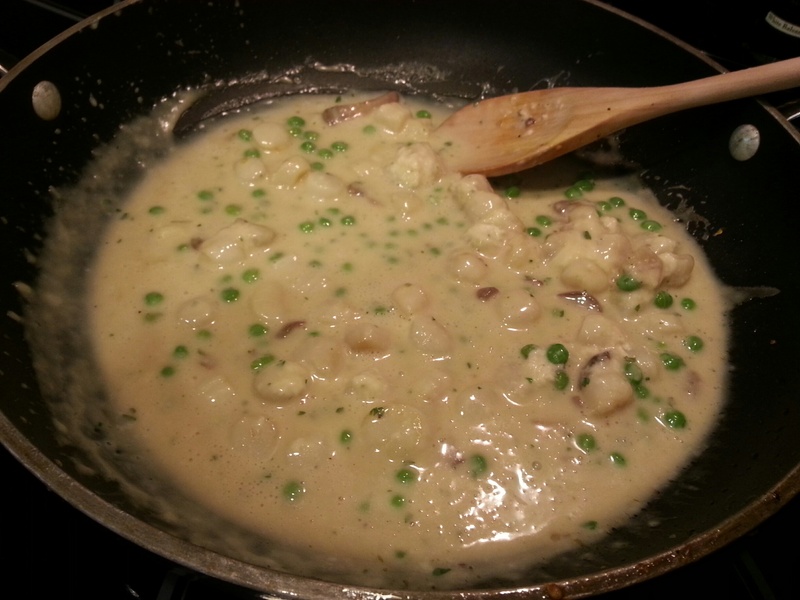 Add Bay scallops, peas and mushrooms. Cook another 3-5 minutes until scallops are done. Do not overcook. The Bay scallops are very tiny and easy to overcook. 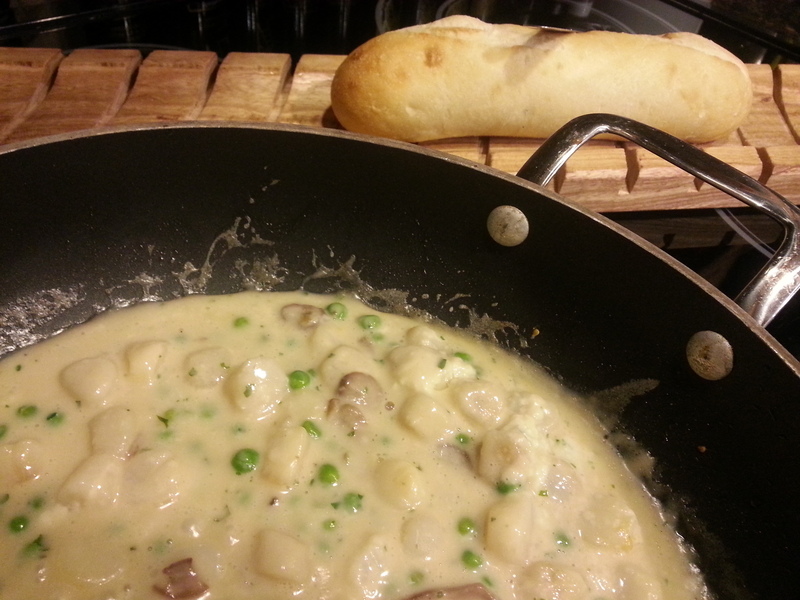 Serve over crusty bread, top with Parmesan if desired. This pairs beautifully with a nice bottle of Pinot Grigio such as a 2012 Santa Margherita, and makes a wonderful, light summer meal. I want to drink wine with you. You crack me up. Girl. You should totally come during the Food & Wine’s Food & Wine Festival. It. Is. Life-changing. I would LOVE for you to give it a try and let me know what you think! This is one of our favorite dips!